When it comes to tasty festivals in West Virginia, it's hard to beat the Mountain State's line-up of varied food festivals. From spring to fall and even into winter, there are lots of mild--to wild-- food festival possibilities including the ones below. The tasty--and sweet--fun starts in mid-March with the Pickens Maple Syrup Festival. Situated in the mountains of Randolph County, Pickens puts on a show every spring, with food (including lots of maple syrup options), live music in the old opera house, art at the train depot, wood chopping demonstrations, and kid-friendly activities. Lewisburg's Chocolate Festival in mid-April features everything chocolate with chocolate tastings; chocolate-themed dinners; a chocolate bake-off; chef demonstrations; a chocolate mousse eating contest; live music and other entertainment; children's activities; and the 10k Chocolate Chase. April also brings the Feast of the Ramson. This ode to ramps has been held in Richwood for more than 75 years. There's a popular ramp dinner (reservations recommended), an arts and crafts show, live music, cloggers, the Ramp Run (a 5K walk or run), and a recently introduced ramp recipe contest. Buckhannon's West Virginia Strawberry Festival in May features weeklong varying events including a carnival, concessions, festival food, lots of music and entertainment, varied arts and crafts, a Children's Day, parades, and more to celebrate the state's strawberry harvest. June means it's time for the annual Smoke on the Water Chili Cook-Off in the heart of downtown Charleston at Haddad Riverfront Park. Festivities include the ceremonial lighting of the grills, lots of chili (and more) tasting opportunities, expert and people's choice awards in various categories, and lots of live music. The event benefits HospiceCare and includes a five-mile Run for Your Life. Mid-summer is a great time to head to the West Virginia mountains, and Snowshoe Mountain Resort doesn't disappoint. In July, Fire on the Mountain Chili Cookoff features two great days of food (chili and more), music, games, and a mountaintop fireworks display. In August, Blues, Brews & BBQ features just that--lots of live blues music, many unique beers, and barbecue, Mountain State-style. In late-summer, the West Virginia Blackberry Festival in Nutter Fort typically features a blackberry pie and cobbler baking contest, a pet parade, a car cruise parade, a talent contest, a carnival, crafts, lots of food and fireworks. Though it's much more than a food festival, it's hard to resist a taste of Labor Day weekend's West Virginia Italian Heritage Festival in Clarksburg. Having celebrated its 35th anniversary in 2013, the festival is better than ever, thanks to a pasta cook-off, a meat ball eating contest, a bocce tournament, the new car and bike show, a homemade wine contest, and much more. Mid-September's 45th annual Nicholas County Potato Festival includes a potato auction featuring local farmers and their prized potatoes, lots of food and live entertainment, a pet pageant, a street dance, a 5K run, a spud hunt (think Easter egg hunt with potatoes), a potato sack race, the Potato Idol contest, and a colorful business district potato-themed decoration contest. Mid-September also means it's time for the Clay County Golden Delicious Festival. With a long history in the state, the golden delicious apple is the state fruit. Clay's Main Street features fun for all ages during this busy festival, including kettle apple butter making, apple pie and apple cake baking contests, crafts, heritage music and dance, a parade, a quilt show, fireworks, and more. In late-September, the West Virginia RoadKill Cook-off and Autumn Harvest Festival takes center stage in Pocahontas County's Marlinton. Featured on the Food Network, the Travel Channel (Andrew Zimmern of "Bizarre Foods" fame served as a judge), and the Discovery Channel, this unique event includes a Roadkill Cook-off (with tastings possible), the Roadkill Pageant to select Miss Roadkill, the Possum Trot 5K Run/Walk, live entertainment, a dog show, and the newly added Harvest Games and WV Biscuit Bake Off. Late-September also means it's time for the Preston County Buckwheat Festival, held in Kingwood since 1938. Today's version features arts and crafts, a carnival, sour buckwheat cakes (typically smothered in butter and syrup or apple sauce), chicken dinners, a popular hot dog stand, the Farmer's Day parade, various livestock shows and competitions and other entertainment. In early-October, the West Virginia Pumpkin Festival is held in Milton. First held in 1985, the festival was originally designed to help local farmers with the raising and selling of pumpkins. Today, along with everything pumpkin, there's the Pumpkin Bake Off, the Queen & Teen Beauty Pageant, the WV Pumpkin Festival Children's Pageant, arts, crafts, business, and concessions booths, a parade, the Largest Pumpkin Weighing Contest, and much more. Salem's annual Apple Butter Festival has been held in early-October since 1985. Apple butter making using copper kettles over open fires is a highlight and then canned and sold to festival attendees. There's also live entertainment, a 5K run, a pet show, a parade, and varying contests--from apple butter and apple pie cook-offs to a beauty pageant and a talent show. 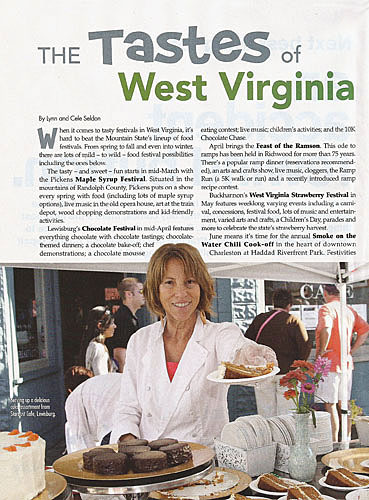 Alternatively, the Apple Butter Festival in Berkeley Springs in the Eastern Panhandle of West Virginia bordering Maryland and Virginia is held over Columbus Day weekend. This is a traditional harvest festival, with parades, live music, family-friendly contests and games, arts and crafts, and lots of food, including dark and spicy apple butter stirred in huge copper kettles in the middle of the town's square. Next, Roane County's Black Walnut Festival typically is held in downtown Spencer on a mid-October weekend. With roots dating to 1954 when Roane County resident Henry Young sold two million pounds of black walnuts, today's festival features parades, a carnival, livestock displays, live street music, a 5K Nut Run and Walk, a classic car show, crafts, and cuisine with the namesake nut included in salads, baked goods, ice cream, and more. Mid-October also means the annual Taste of Our Towns. Held on the second Saturday of October in historic downtown Lewisburg, highlights include more than 50 varied vendors, with The General Lewis Inn's pecan pie and varied treats from chefs at The Greenbrier among many tasty food highlights. There are also children's amusements and activities, live music, fire dancing, comedy, dance, and more on three stages and the streets. West Virginia food festivals don't end come winter. In January, The Greenbrier in White Sulphur Springs welcomes the Cast Iron Cook-Off, appropriately is dubbed A Culinary Extravaganza. Chefs and their teams prepare multi-course meals using cast iron cookery and local West Virginia farm products. In addition, February at The Greenbrier means its popular Culinary Weekend and Blues and Brews Weekend. *Rules for the West Virginia RoadKill Cook-off state that all meat must contain 20 percent wild game and can include any animal commonly found dead on the side of the road including groundhog, opossum, deer, rabbit, bear, crow, squirrel, and snake. Pork, beef, chicken, and other meat fillers are allowed can make up the difference. Welcoming guests to West Virginia’s White Sulphur Springs for more than 230 years, The Greenbrier is truly better than ever. The 10,000-acre luxury retreat has had a guest list that includes more than 25 presidents and many more celebrities, royalty and business leaders. One of those past business leader guests, West Virginia businessman James (Jim) C. Justice II, has transformed The Greenbrier since his company purchased the resort and related Greenbrier entities in 2009. The Greenbrier’s many additions and enhancements since then mean The Greenbrier is once again a Mountain State treasure. Situated less than 120 miles from West Virginia’s thriving capital city of Charleston and also only 15 minutes from historic Lewisburg The Greenbrier now offers more than 55 activities, including four golf courses, the world’s only five-star mineral spa, shopping, gaming, equestrian sports, fishing, off-road driving, conference and meeting space for up to 2,500 people, and much more. The resort’s kid-friendly additions have garnered much praise -- and many more young guests and their parents and grandparents. Children 12 and under enjoy many complimentary activities with a paid adult and receive a VIP key card at check-in, giving them access to special prizes and more. The new Adventure Zone specifically features lots of options for children 3 to 12, with full-day and half-day time slots. There are also evening programs for kids 6 to 12. Of course, Greenbrier also means world-class golf. In 2013, The Greenbrier acquired Oakhurst Links (1884), museum and clubhouse -- the first golf course designed and built in the United States. Period golf clubs and balls are provided, plus forecaddies and period gear (including clothing) are recommended and available for purchase at the golf shop. The resort also partnered with Sir Nick Faldo to create The Greenbrier Faldo Golf Center, a full-service program featuring “A Swing for Life” teaching theories, Faldo equipment, fitting systems, multiple practice facilities, video analysis and more. In addition, The Old White TPC (1914) -- named after the original Old White Hotel (1858 to 1922) turns 100 in 2014. Away from the links, many other additions have been welcomed at the resort since 2009, including: the elegant Casino Club, Prime 44 West steakhouse, The Forum Italian restaurant and Pacific Rim cuisine at In-Fusion. The resort’s dining scene also has been enhanced by The Greenbrier Chef’s Garden, where they grow about 25 varieties of fruits and vegetables without pesticides for the restaurants. In addition, off road adventures on UTVs (utility task vehicles) take advantage of the resort’s stunning landscape with a 30-mile course featuring lots of rocks, ruts, creek crossings, gulleys and steep inclines. Finally, the resort’s famed falconry program features the opportunity to interact with trained falcons and hawks -- and kids 12 and under can participate with a paid adult.